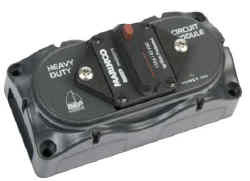 705 Contour Circuit Breaker HD allows switchable protection for heavy duty circuits like Windlasses or Davit winches utilising Bussmann Heavy Duty thermal circuit breakers. Modular sizing with contour lock moulding allows easy grouping. LED to indicate circuit is on.Five standard ratings available.